There were plenty of complaints in the mainstream media and the blogosphere when Apple announced its iPhone 7 ships without an analog headphone jack. The idea of forcing users to toss their older headphones to use Apple's new Lightning port-enabled ear buds or buy its soon-to-be-released $159 wireless AirPods created a visceral reaction in consumer circles. Industry pundits also speculated that third-party adapters allowing analog headphones to connect to the iPhone would soon follow... and so they have. Los Angeles start-up ildockgear has created a Lightning adapter that allows iPhone 7 users to charge their device and listen to music over analog headphones at the same time. The device is about the size of a U.S. quarter. The ILDOCK with its headphone jack and Lightning charging port. The company began a crowdfunding campaign on Kickstarter three days ago for its ILDOCK, and it has already garnered more than $20,000, four times its original goal. In addition to the basic ILDOCK adapter, which contains a 3.5mm headphone jack and a Lightning charging port, the company has also produced an ILDOCK Plus, which adds an SD card slot, a microSD slot and USB ports. Users can connect up to a 128GB flash card with ILDOCK Plus or connect to any size USB drives, the company states in its marketing material. The ILDOCK Plus's ports include an SD slot, a microSD slot and a USB port, along with the Lightning and analog headphone jack ports. The ILDOCK and ILDOCK plus come in four iPhone 7-mimicking colors: Silver, gold, rose gold and "space" gray. 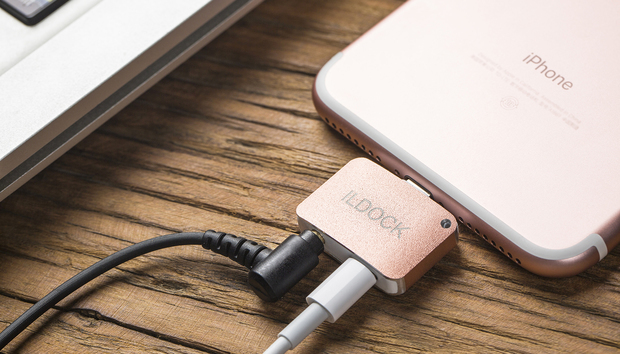 In addition to compatibility with the headphone jackless iPhone 7, the ILDOCK also works with any iPhone or iPad with a Lightning port. 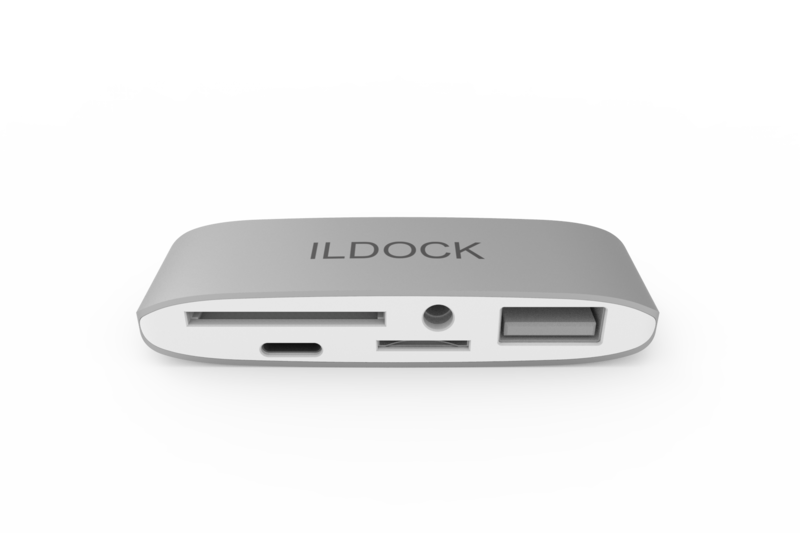 The ILDOCKs are expected to begin shipping in November.